A brace of salmon taken on a great day at the Rangitata River. Occasionally I saw the salmon jump before I lost it; at other times I suspect that what took my gear and then wriggled away was a trout, and then there were times when I probably hitched onto a moving snag: in any case this year I failed to produce a single salmon on the bank. My Friend and I decided to embark this year on a quest for the ”Holy Grail” of salmon fishers – the perfect permanent hole, as yet undiscovered. This search took us along most of the riparian margins known to salmon-kind, but now I’ve learned that exploratory forays into uncharted territory can be a waste of time and effort. Next year I’m resolved to concentrate on one river as I track down the elusive Houdini. We started off tentatively, spending Christmas at Mt Hutt Lodge and keeping our binoculars trained on any likely looking fisherperson or jetboat. There had been some early runs and we heard fish had been taken from a favoured gut below the bridge, but our days there brought not even a sighting. Anyway, we fished three beautiful holes and saw nothing until walking along the clifftop on the way back when we spied this enormous fellow broaching not far from the intake. Of course, he’d vanished by the time we completed our excruciating slide down the hill. We arrived there one glorious still evening, and under a gorgeous sunset, my only catch was to be a small trout. 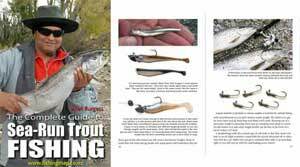 The next morning there was considerable excitement as Houdini attached himself to my lure, but as I moved down the river with him, he jumped, ﬂipped and escaped – apparently foul-hooked. Consoling words were said, along the lines that there were a lot more like him where he came from. Indeed? Duty called in the form of a work trip through the Molesworth (it’s a tough life), and we decided to check out stories from not such reputable sources: friends who were locals and swore to sightings just over Jacks Pass, in the Clarence, and in the more remote reaches of the Acheron. Two nights camping and two days stalking anything finny passed pleasantly enough as we decided this was definitely another wild goose chase. This was the day I became convinced the fish called Houdini was out to get me. In the right conditions this river definitely has prospects, and in mid-February, we were surprised to find ourselves the only fisherpeople there. At the mouth, Friend hooked into a salmon on the retrieve, close into the bank. It made a run to the middle, but instead of going down as a good salmon should, it rushed straight back to the bank, thrashed its tail on the stones, and did a Houdini. Seeing the distant spray of a salmon travelling through thin water, we moved upstream for a reconnaissance. There, “Him Outdoors” was startled to spy a 20lb-plus Houdini lying in about a foot of water in a side stream. Friend failed to get the lure in the right place, but as he felt it touch his hide, Houdini had a snap at it, then rushed away through the shallows, setting up noisy and spectacular splashes of water and shingle. At this point, as infuriated as him, we gave chase. Friend headed up past the fish to a likely looking gut, while I sploshed along the narrow shallow channel to flush Houdini towards him. This salmon was a remarkably cool customer because it was only when my left hoof was about to come down on his tail that he flew out of the water about two feet from my nose and shot away across the gravel again. 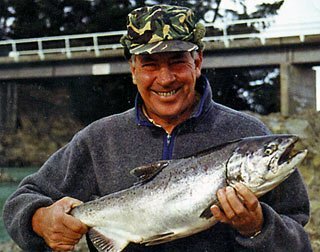 At this stage, my blood was up, and in my frustration, I even considered a one-on-one tackle, but unbelievably he found a small channel that slipstreamed him into the river, and he disappeared from view forever. 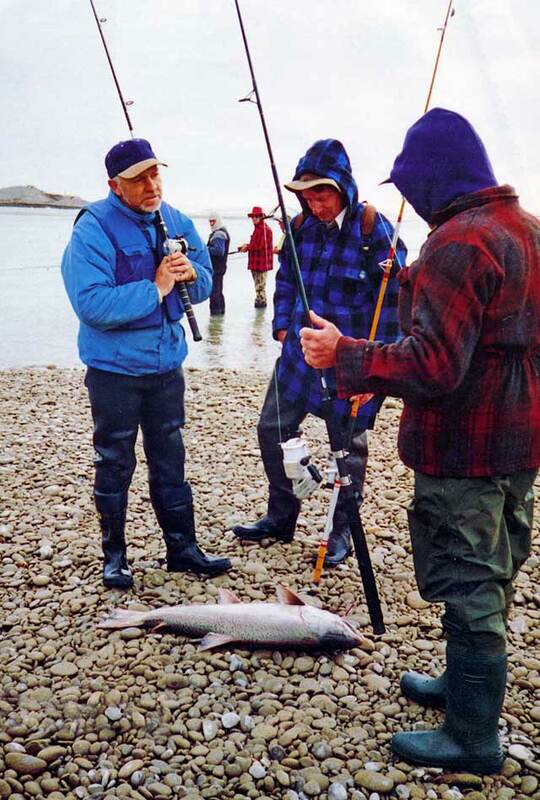 Three anglers examine a salmon catch. There were more abortive trips to the Waimakariri, the Hurunui and the Rakaia Rivers in February, but how irritating it is to have to work when Friend is catching fish with your rod. It seems that all season you never are there when the action’s on, and whenever you are there, it’s not. (Incidentally, the trophy brought home on one occasion was christened ”The Hunchback of Notre Rakaia”. Fish and Game tell me its distorted state was probably the result of injury rather than chemical pollution or sickness, but our mate Alex has dubbed the hole where he was caught the “Hospital Hole”). Another work trip took us to the Waitaki River in early March; we arrived at the mouth one evening just as the big catch ended, and the next morning only two fish were landed. But Friend’s success this season is partly mine, I consider, as dropping him off at likely spots fitted in with my work, and March ended with a bang, the Waiau and the Rangitata (thanks Irwin) turning out to be his “Hot Spots” for 1997. However, Houdini, l have not forgotten you, and you will be the first on my list for next season.